AJ's Restaurant: Breakfast served daily. Indoor and Outdoor seating available. Crust: Crust is our partner restaurant, serving lunch and dinner. Focused on large portions and simple Italian cooking, Crust features an old world atmosphere with vintage light bulbs dangling from the ceiling, patterned wallpaper and restored wood. 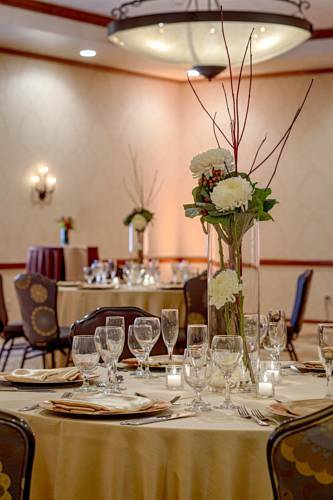 San Marcos Ballroom: Grand Ballroom with chandeliers subdivides into two rooms. Accessible to automobiles. San Tan Ballroom: Junior Ballroom set up lower ceiling height, no chandeliers or columns, ground level, accessible to automobiles. El Jefe: Located on 2nd floor corner meeting room with double door access. La Vista: 2nd floor courtyard views, double door entry. Agua Fria: 2nd floor courtyard views, quiet corner location. Palomino: 2nd floor meeting room and popular for wedding receptions, double door entrance, doors leading out to outdoor patio. Pillar in the room. Chandler Theater: Classroom Auditorium Seating. Front and rear entry. Palo Verde: Meeting room has abundant natural light and front and rear door entrance. Executive Boardroom: Executive style meeting room with courtyard views, fireplace, reception area, plush leather chairs. Mesquite: 2nd floor meeting room with lots of natural lighting. Front and rear door entry. Agua Vista: 2nd floor meeting room with abundant natural lighting with a view of the pool area. La Vaca: This meeting room is located on the second floor and has abundant natural lighting. Paloma: 2nd floor meeting room with abundant natural lighting. Chandler Fashion CenterFrom fresh new looks to classic styles, our stores have it all. Check out our directory to find your favorite stores, dining and more. San Marcos Golf CourseUSGA 18 Hole Golf Course. Sim MarcosSim Marcos is our state of the art golf simulator that is perfect for practice, learning and fun! San Marcos Golf CourseEstablished in 1913, the San Marcos Golf Course was Arizona's first golf course. Recent upgrades and renovations have made it one of the best. Enjoy 18-holes of world-class championship golf during your stay at San Marcos Resort. Chandler Center for the ArtsChandler Center for the Arts is a visual and performing arts theater located in downtown Chandler. Top Golf GilbertTop Golf is an entertainment and event venue with fun point-scoring golf games for all skill levels, with upscale bar food and drinks. Main Event GilbertEat. Bowl. Play. Laser tag, rock climbing, mini golfing, karaoke, video games, billiards, gravity ropes, virtual reality, and bocce ball...there is so much to do at Main Event! Lone Butte CasinoDining. Entertainment. Gaming. Check for shows and promotions. Golfland SunsplashGolfland Sunsplash features over 30 exciting rides and attractions in one location! From thrilling waterslides, to award winning miniature golf, Golfland-Sunsplash has something for the whole family! Alamo Draft HouseDine-in cinema with the best movies, food, drinks, and events! Bondurant School of High Performance DrivingHigh performance driving and racing. Check for classes, events, and special promotions.